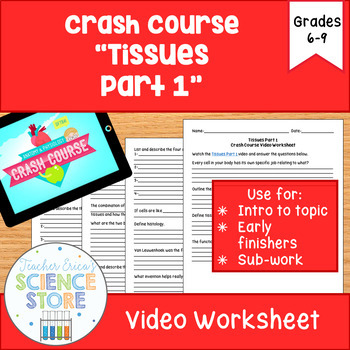 Crash Course- A&P: Tissues Video Worksheet- BUNDLE! Crash Course is a YouTube series that gives a student friendly and understandable break down of a wide variety of science topics. 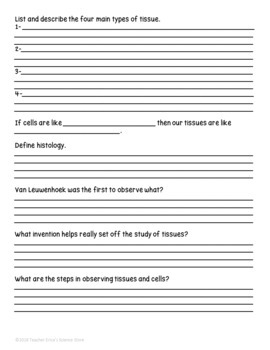 This video worksheet accompanies Anatomy & Physiology: #2 Tissues, Part 1, and is an excellent introduction to the history of the discovery of tissues, the basic characteristics of epithelial, muscle, nervous and connective tissues. 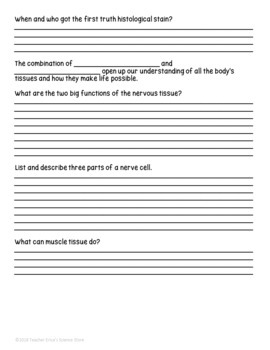 This 17 question video worksheet is perfect as an introduction to tissues, for use with early finishers and for filling time on half days, or as sub-work when you unexpectedly have to be absent. I am working on in-depth worksheets to the entire Crash Course videos in Biology, Engineering, History of Science, Ecology, Chemistry, Anatomy & Physiology, Physics and Astronomy. Make sure to follow me to stay updated when new worksheets come out!